The Ford Model T was one of the first mass produced vehicles, and some saw service during World War 1. 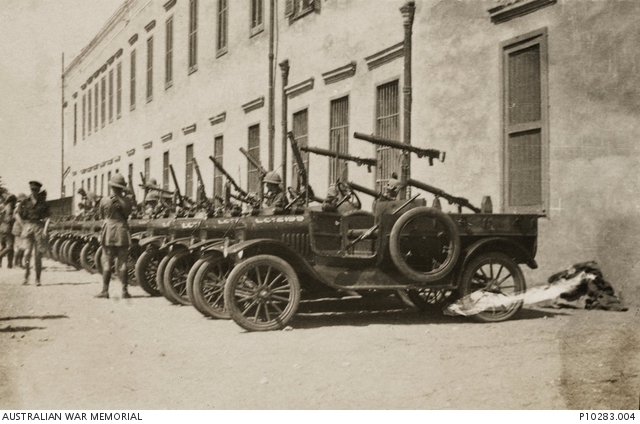 The Australian Mounted Division acquired some of the British production Model T's and they were deployed in Egypt and Palestine during the later part of the war. The vehicles included a mounted Lewis gun and were label Light Car Patrol. A newer kit from ICM represents the Model T 1917 as it served in Palestine during 1917-1918 for the Australian Army. Opening the box from ICM for this kit the first thing I noticed was only two sprues, but being a small car, those sprues contain some nice looking parts to build a Model T. The parts are molded in a tan colored plastic, and a glance of the sprues shows good moldings with very little flash, but does have some ejector marks that will be seen after constructions. The molding of the fine parts is done very well, and overall the surface details is well done, with the exception it would have been nice to see some wood grain details on the floor of the cargo bed. Being a very early vehicle there is not a lot of details, but the kit does include a nice looking motor and frame details, including the front axle and suspension. A nice touch was to mold the front axle and suspension as a single piece, this will allow easy assembly. The engine details do include the radiator hoses to the radiator, and with the option in the kit to open the bonnet, some simple wiring can be added to show it off. The interior of the cab is very simple, with only pedals, a brake lever, and steering wheel. Which at the time is all that would have been present. The seat shows some good looking seam lines and the steering wheel and steering column have some nice looking fine details. The mount for the Lewis gun is very simple and prototypical of the time. And while the molding of the Lewis gun itself is good, the business end is solid and would need to be drilled out for a better look. One negative I did find is in the running boards, while the instruction show there should be surface tread details, those are not present of the part. Also have the Model T WW1 Ambulance from ICM, I checked that kit, and the tread details were present on the molded parts. The wheels for the kit are also done well, with nice looking subtle tread line around the circumference, and nice looking spokes. Also the kit does provide the option of two radiators, one with the raised Australian emblem and one without. This provides a nice flat surface to mount the decal if you choose that marking option. The decals are very well printed, crisp and colorful, and all in register. The kit has marking options for two seperate vehicles, both in Palestine, 1918. The instructions are well laid out, and very easy to follow. Paint callouts are included with references to Revell and Tamiya paint colors. Building this little kit from ICM was a lot of fun. The small number of parts provide a relatively quick build. The overall fits of the parts is good, but I did have a few issues getting the upper portion of the front cab lined up with the front hood. Here I stepped away from the instructions, and mounted the part after I have added the side wall, to ensure it aligned correctly. There is also a little bit a misorder in the instructions, it show the mounting of the seat prior to added the wall between the cab and cargo bed. I found that you need to add the separator wall first, prior to adding the seat. Also as mentioned above the Lewis gun has a solid barrel end, so I did use my pin vise to hollow out the end for a better look. According the instructions, it called for a Sand color, and not having any reference material, I used Vallejo Air Sand. After a coat of Future, the decals went on very nice. Warning though, the carrier film is VERY fine, and you will need care to apply. The raised emblem on the front radiator does make it easier to mount the front Australian emblem, but just be careful with the alignment. I found after the decal had dried, I was off just a touch. The clear plastic for the lights were added, with some clear red added to rear light, and presto a nice looking model of the Model T LCP. The Model T kit from ICM is like a little gem, even with a small part count, it builds into a real nice looking model. The plastic is well molded with good looking details. A few small gafs are that the running board tread details is missing, and the Lewis gun barrel end could have benefitted from a little slide molding. Overall during the build I found the fit very good, and there are just a couple of small mis-steps in the instructions. For a great subject, I would definitely recommend this kit. Nice job on the build and review Kevin! What a great change of pace from the modeling norm. Like what I see on the sprue. The last image is patrol cars attached to the RAF Aramament School in Cairo and not the Australian Light Car Patrol. So petbats suggestion that all rear fenders were removed may be correct. However things from that time were not as well documented as there are now, so with or without can be correct. All the images I have found of LCP cars are without.